George Stigler received the award for his seminal studies of industrial structures, functioning of markets, and causes and effects of public regulation. He is among nine Chicago Booth faculty members to receive the Nobel Prize in Economic Sciences since 1968. Stigler joined the faculty of Chicago Booth and the department of economics at the University of Chicago in 1958. 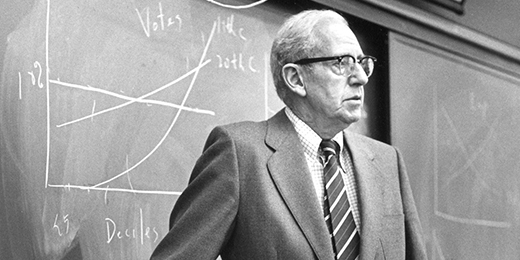 Stigler is best known for developing the Economic Theory of Regulation, which says that economic and political interest groups will use the regulatory and coercive powers of government to shape laws and regulations to benefit themselves.